distributor itself. A crankshaft or camshaft rotating sensor (fig. 4-40) is used to provide the electronic control unit with piston position and engine speed. This signal is used to trigger the correct coil at the correct time for high-voltage spark. There are several types of this system currently on the market. For testing and repair, consult the manufacturers maintenance manuals. Use only the correct tools and testing equipment when working on these units. As an automotive electrician, you will be called on to troubleshoot the conventional, transistor, and electronic ignition systems. The instruments you need to pinpoint problems in a conventional ignition system include the simple voltmeter and ohmmeter. Although an engine analyzer simplifies the troubleshooting of electronic ignition systems, you can do so with a volt-ohmmeter (0 to 20,000-volt/ohm range). Better yet, you may use an ignition scope tester since it can test system components while the engine is running. 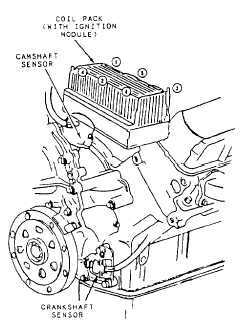 Figure 4-40.-Components of the distributorless ignition system found in some General Motors products. whereas the secondary voltage could be as much as 30,000 volts. 2. With the ignition switch on, jiggle it and watch the voltmeter. The switch is defective if the meter needle fluctuates. The voltmeter should read a steady 5.5 to 7 volts with the points open on systems using a ballast resistor. 3. Crank the engine and watch the voltmeter. It should read at least 9.6 volts while the engine is being cranked. 4. Remove the jumper wire from the coil; then start the engine. The meter reading should be 5 to 8 volts on a ballast resistor system while the engine is running. 5. Stop the engine by turning off the ignition switch. 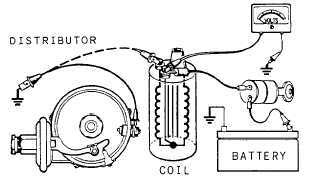 Hook up the voltmeter between the distributor side of the coil and ground. Remove the high tension wire from the coil and ground it. Figure 4-41.Testing ignition primary circuit.